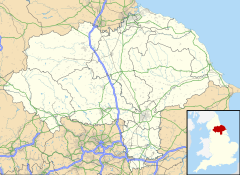 Warrenby is a place in the borough of Redcar and Cleveland and the ceremonial county of North Yorkshire, England. Situated on the edge of Coatham Marsh, Warrenby was originally called Warrenstown when it was founded in 1873 to provide housing for workers at the nearby ironworks of Downey & Co and Walker Maynard. In the Warrenby Disaster of 1895, eleven men, many from the village of Warrenby were killed in a massive boiler explosion at the works. Although it was on the route of the Middlesbrough & Redcar Railway, Warrenby did not have a station until 1916 when Warrenby Halt was opened mainly to serve the nearby Dorman Long works. The halt closed in 1978 when the railway was realigned to make way for the new Redcar steel plant. Today Warrenby is no longer a residential area but is given over to light industrial units. Christopher Upton This is not for the faint hearted .The real dog eat dog world . Disappearing History South Gare, Teesside. ^ "Warrenby Village". Communigate. Archived from the original on 21 February 2009. Retrieved 5 January 2010. ^ "Warrenby Disaster". Communigate. Archived from the original on 3 June 2009. Retrieved 5 January 2010.